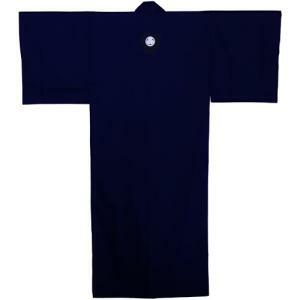 A plain lightweight blue cotton kimono featuring the mon (family crest) of the Tokugawa shoguns - three hollyhock leaves inside a circle - embroidered in white thread. The mon (diam. 5cm) appears once on each front panel and once on the back just below the nape level. Recommended for medium to large build; height 5ft9" to 6ft. Sorry this item is temporarily out of stock! Please double-check this email address is correct, otherwise we will be unable to contact you.